Tavia Ramsey receives anywhere between 30-60 calls a day. 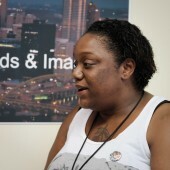 As Intake Coordinator at Community Human Services, Ms. Ramsey is the first voice a potential client hears when they call the Strip District charity in search of assistance. Three years ago Richardson was working in Tampa Bay, Florida, volunteering with the homeless in her spare time, when a chance encounter led her to her current position with CHS. “I’ve never been more excited to work somewhere,” she says. Richardson says that it takes a special type of person to work at CHS and that selflessness is one of the most important character traits to have in this line of work. She stresses that CHS goes out of its way to offer self-help services like meditation to their employees, but even then, the work can take its toll. “It’s hard because we see people at their lowest,” she says. After CHS administers assistance, they may never hear from a client again. And with homelessness worse than it has ever been in Allegheny County, there isn’t much time to reflect on past success. So what better way to celebrate those successes than by throwing a party? On July 30, CHS hosted their inaugural Customer Appreciation Day for past and current clients. There was Rita’s Italian Ice, a bouncy castle, free haircuts and manicures, clothing, health screenings, bingo, and what seemed like enough Manny and Carol’s pizza to feed Pitt’s entire incoming freshman class. CHS Chief Residential Officer Brandi Harrison stresses that CHS helps people from all walks of life, and that no two cases are the same. She shares stories of elderly individuals who found themselves in need after the death of a spouse, and another of a man with two Master’s Degrees who became homeless after an arrest for an outstanding speeding ticket. Lately, she finds that more and more people in need of assistance are veterans. CHS is currently unable to accept new clients for housing assistance, due to a lingering budget impasse in the Pennsylvania General Assembly. Despite this frustrating state of affairs, none of the staff expressed any bitterness or resignation. To a person, everyone stressed that they would continue to help others with the resources available, for no other reason than it was the right thing to do. One of the first things Storyburgh witnessed upon arrival at Customer Appreciation Day was Executive Director Adrienne Walnoha carrying a pair of heavy chairs down the hallway like a couple of empty pails. Several of her colleagues offered to carry the chairs for her, but her purposeful stride made it clear she was fine on her own: something needed done, so she did it. Then it was on to the next task. Do you know ........... ? If you are clients or former clients (or if you know one) of CHS Corp and other Human Services organization, please contact us. With your permission, we would like to share your stories — both struggles and successes — so we all can learn from them. Don’t worry if writing and taking pictures are not your forte, we will work together with you.